Talking about Da Lat, most people would think of it as the city of flowers or the city of a thousand pine trees but one intrepid traveler discovered that the city deserved another nickname: city of romantic lakes. 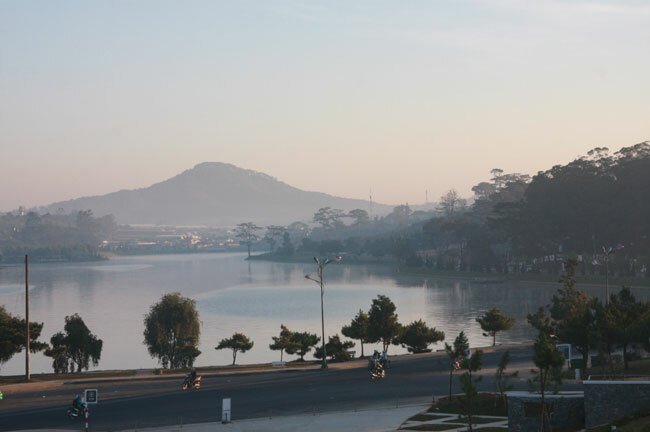 Not many cities across Viet Nam have lakes and to have three romantic lakes located both in the centre and the outskirts of the city is unique. Da Lat, is home to Xuan Huong Lake in the centre of town as well as Tuyen Lam and Da Thien Lakes in the outskirts of the city. The first lake visitors see is Xuan Huong Lake, the most famous lake of the three. Even though the lake is in the heart of the city, it retains its natural beauty. The sickle-shaped lake is about 7km in perimeter and has an area of five square kilometres and despite the fact that the lake lies in the centre of a town with a population of over 200,000 inhabitants, until now it has remained largely free from the blights of heavy construction. The lake is surrounded by an asphalt road with a wide sidewalk lined by pine trees at the edge of the water. There are a couple of cafes, shops and restaurants around the water's edge, but they don't infringe on the lake's beauty. 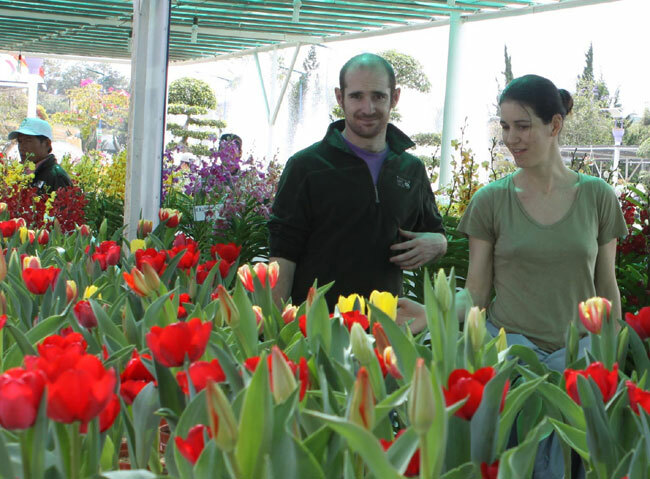 At the north of the lake is a golf course dotted with pine trees and a big garden of flowers called Da Lat Garden of Flowers which displays hundreds of various flower species artistically arranged in different shapes – well worth visiting. The south of the lake is home to a few colonial buildings, including the famous main building of the Da Lat Methodology University with its original and unique structure and the Yersin park, which is named after Alexander Emile Jean Yersin, a Swiss and naturalised French physician and bacteriologist, who is known for his discovery of the bacillus responsible for the bubonic plague. Riding on horse-drawn carriages, which are available by the lake, is probably the most romantic experience in Da Lat. For VND250,000 (US$ 12), you travel on a beautifully decorated carriage around the lake. The best time to see the lake by carriage is at dawn or dusk. Another option is to take a walk or hire a bicycle, which will cost you a dollar an hour, and is the next best way to see the lake. Or you could hire a pedalo to see the lake from a different angle and take in its fresh air. "Da Lat is an amazing city, it's different from other destinations in Viet Nam. The climate is cool, and the houses are very beautiful and unique," Sabah Yafit, an Israeli young visitor, said. "The lakes are very nice and romantic as well. It is great to take a walk around Xuan Huong Lake," Sabah added. Meanwhile Sebastien and his girlfriend, who are from Germany and are visiting the city, said that they appreciated very much the quietness and tranquility of the city and the beautiful views of Xuan Huong Lake. If Xuan Huong Lake is not enough, there is another lake on the edge of the city whose area is so huge that it will take you a whole day to discover. Current affairs: Visitors can ride motorboats around Tuyen Lam Lake. 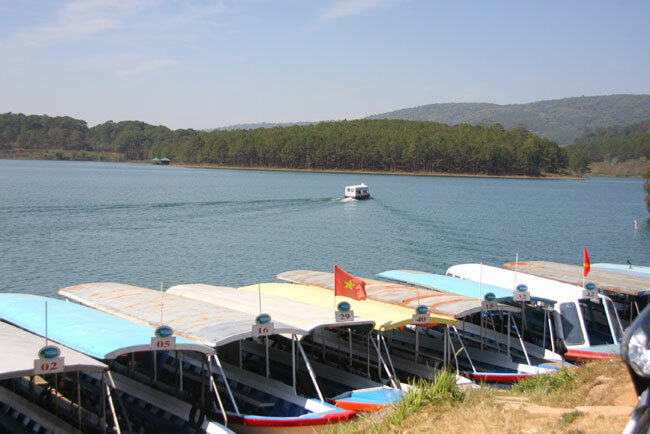 Tuyen Lam Lake is about seven kilometres from the centre of the city and the largest man-made lake in the city. It is also one of 21 national tourist areas, which covers an area of 320 hectares and is surrounded by hills covered in pine trees. Because of its location away from the busy centre, visitors are rewarded with natural beauty, an air of tranquility and a pure atmosphere of cool fresh air, which has made Da Lat an excellent place for people in the south to escape from the summer heat, for over 100 years. You can hire a motorbike, which will cost you six dollars a day, to wind down the asphalt roads running along the edge of the lake, lined with Prunus Cesacoides. Or you could stop at the boat station to take a motor-powered boat trip around the lake and visit tourist sites scattered around the lake such as Truc Lam Zen Monastery. Last but not least, it is Da Thien Lake in the valley of love or the vallee d'Amour as it was called by the French sixty years ago, an area growing in popularity with tourists. Like Tuyen Lam, Da Thien is also surrounded by hills of pine trees but it is much smaller in size. Like Xuan Huong Lake, visitors can also hire pedalos to enjoy the impressive pine hills or take a ride on one of the horses imported from Australia to go sightseeing round the lake. There are also horse-drawn carriages by the lake but they're not as impressive as those at Xuan Huong.